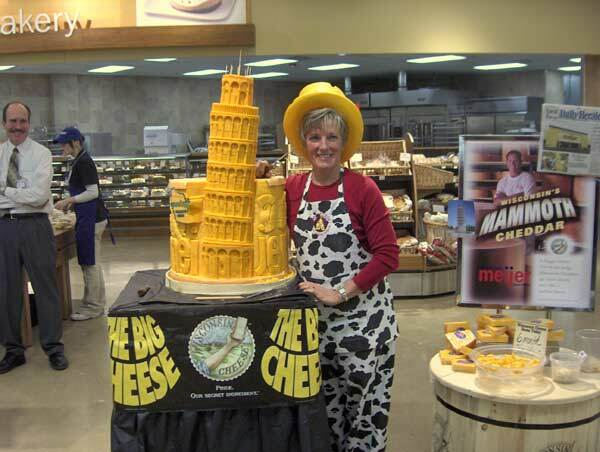 Gapers Block reports that "World-famous cheese sculptor Sarah Kaufman" will be carving at the Niles Meijer this weekend. I believe it was Sarah Kaufman (a Wisconsin native by the way) who carved the spectacular Chicago skyline at the American Cheese Society 2008 meeting. According to Gapers Block, this time she'll be carving the Niles skyline (thewhat?). How about the Leaning Tower on Touhy? Thanks! I will definitely be there to see her in process. A friend went yesterday, then left an enthusiastic voicemail about this event. 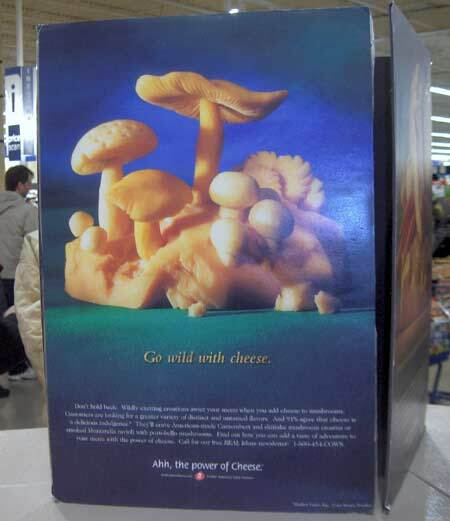 Not only did she find the artist interesting to talk, they are discounting the cheese. She provided an example of a cheese normally costing $7.99/lb was now $4.99/lb. I plan to stop by sometime today. I love stuff like this. Dave, you are a winner! She did carve the Leaning Tower on Touhy! I arrived just as Sarah finished her masterpiece. When we were there, Sarah was all business. She was showing her effort to the Meijer's manager. Taking pictures with store officials. Showing them press coverage from this cheese carving event and all the cheese sold. She proved to them she earned her keep. Ha! I love that our skyline is one building and a billboard. Home sweet home! Next time I cut the cheese, I'll be thinking of you. Pie Lady wrote: Ha! I love that our skyline is one building and a billboard. Home sweet home! It wasn't exactly a billboard flanking the tower, it was the Meijer name. My Mom thought I was goofy to make a detour to Niles on our way to Grayslake. Once she saw it, she was glad we did it. It was really quite well done. I overheard Sarah commenting this cheese sculpting effort really took over her life the last five years. She seems to be in heavy demand. Now if she branched into butter figures, she would really have a full dairy art life. Cathy2 wrote: I overheard Sarah commenting this cheese sculpting effort really took over her life the last five years. She seems to be in heavy demand. Now if she branched into butter figures, she would really have a full dairy art life. The skyline of Niles! I'm sorry I missed this event. Thanks, Cathy, for sharing pictures. I'd love to see more people taking after Tibetan butter sculpture with less agricultural subjects (not necessarily religious) and more color. 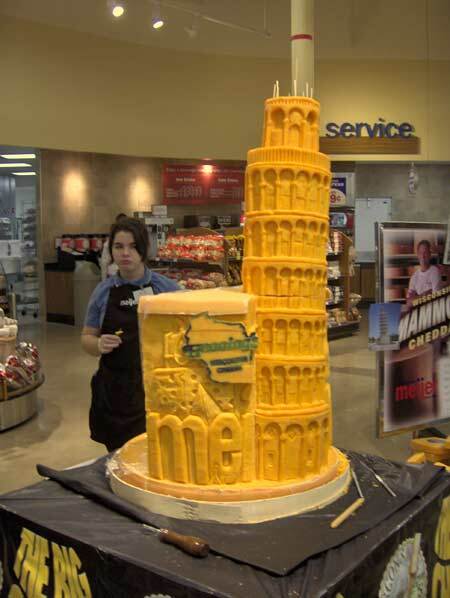 Via my flickr account, I was asked to lend my carved cheese Pisa picture to group Leaning Towers of Pisa in the world. Quite a few cakes and chocolate pisas, but only one carved from cheese!